I am a massive Halloween fan I always love to get into the spirit be that by baking, dressing up or watching an insane amount of horror films. 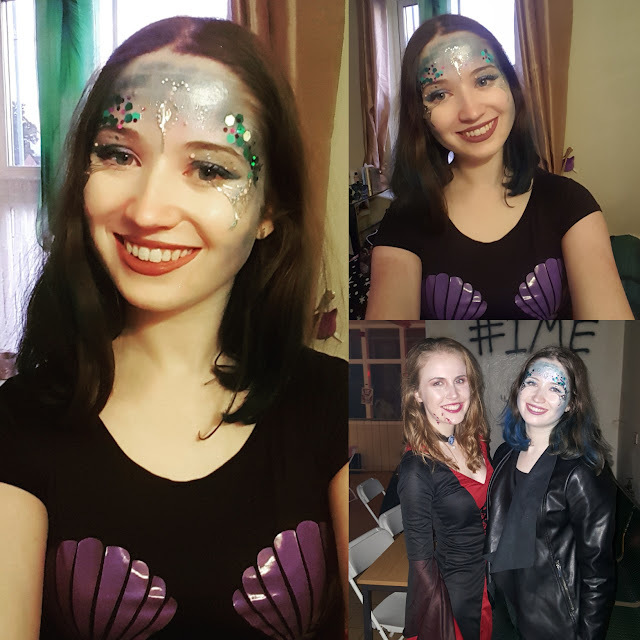 As we were actually going out to celebrate Halloween this year by visiting the local prison for a scream park I figured dressing up was a must! I wanted to try something a bit different this year, in the last few years I went for the creepy broken doll look this time around I have attempted a simple mermaid look. Dip Dyed blue hair using Colorista Spray 1-Day Colour in Turquoise. If you have a pair of fishnet tights and a variety of multi-coloured eyeshadows this look is simple to create. You need to put the fishnet tight over your head covering your face, dabbing one colour eyeshadow around the forehead and contour area till the powder is dark enough and has a scale effect. To begin with I used the Coloupop Coconut eyeshadow which is a dark blue. I then went around again repeating the same effect using the Aqua Shine Shimmer Highlighting powder to create a fading effect as this is a lighter blue. Just for good measure and a contrasting effect I went around again using the Pop Culture eyeshadow giving some of the scales a more purple than blue glow. Once finished with this I removed the fishnet and blended out any harsh lines. I then went round and added a few areas of highlight with the Jeffree Star Ice Cold highlighter to add the shimmery effect to the scales. After this I then used the coconut eyeshadow and pop culture eyeshadow in a smok eye look to add to the effect. Then I finished off the look by adding the Primark face stickers under my eyes, under my eyebrows and in the middle of my forehead. As well as sticking some glitter around my eyes for the finishing effect. I also sprayed the ends of my hair with the Colorista 1-day colour in the shade turquoise. While this added a great effect to my costume it really messed up my hair. It quickly became immensely knotty and unmanageable. I had to wash it over four times to get all the colour out and the ends of my hair are still feeling incredibly dry and straw like. This stage I would not repeat again and while the colour came out fantastic I don't think I would use one of these spray in colours again. Overall this was an easy look to create, I found keeping the fishnet tight still to be the hardest part. As a first attempt I do believe this came out quite well and I was very pleased with the result.